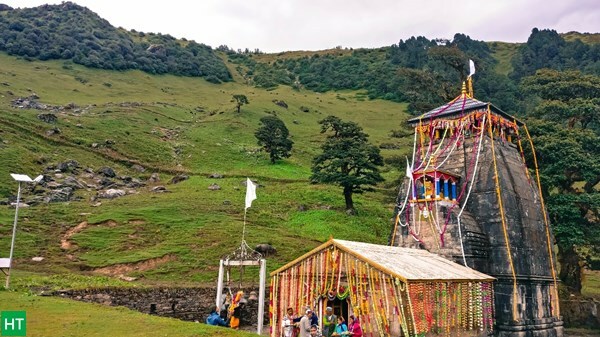 Historically it says that Panpatia Col is the connection between Badrinath and Kedarnath . 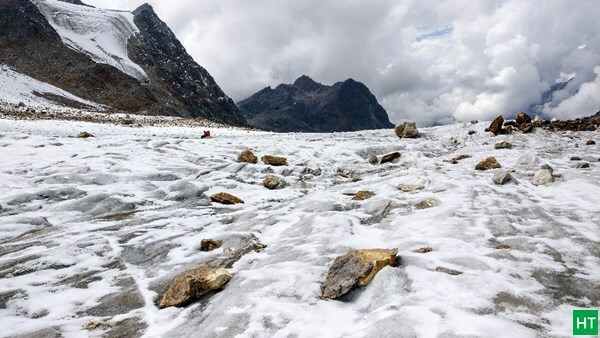 This route is one of the highest passes of Himalayas where one has to walk over the mysterious Panpatia Glacier. Legendary mountaineers Shipton and Tilman first crossed this in 1934, albeit with hardship. 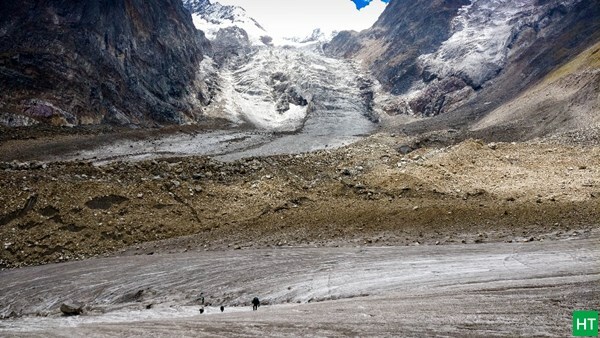 Later in 1998 famous mountaineer Martin Moran and team successfully walked on this glacier, almost following the same route of Shipton and Tilman. 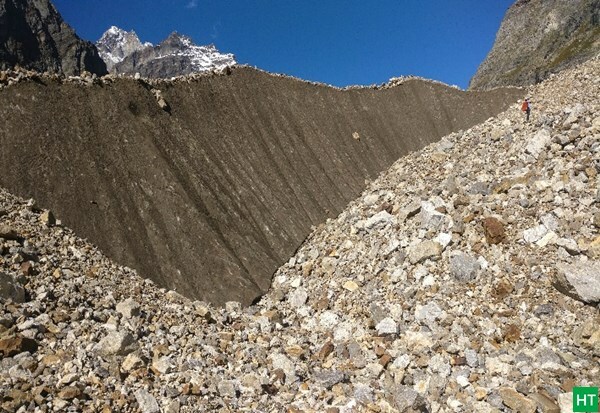 Those were the legendary mountaineers and many attempts after that by the new age mountaineers. The shorter route that was first attempted was under the leadership of Tapan Pandit from West Bengal in the year 2007. In our attempt to Panpatia we planned to follow Tapan Da’s (elder brother in Bengali) footsteps. 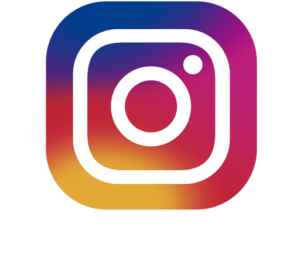 We took logistical support and expedition guide from HIMALAYA TREKKERS. 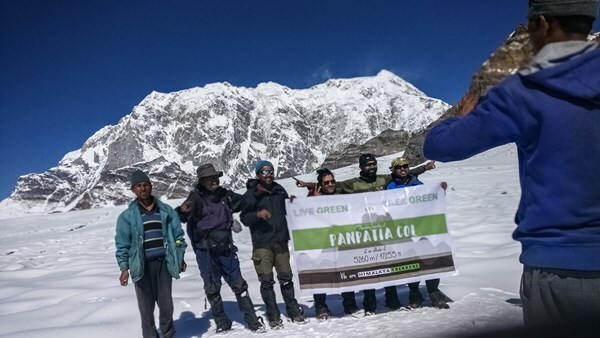 Finally a motley group of five people decided to attempt the Panpatia Col in the beginning of post monsoon, early September 2017. 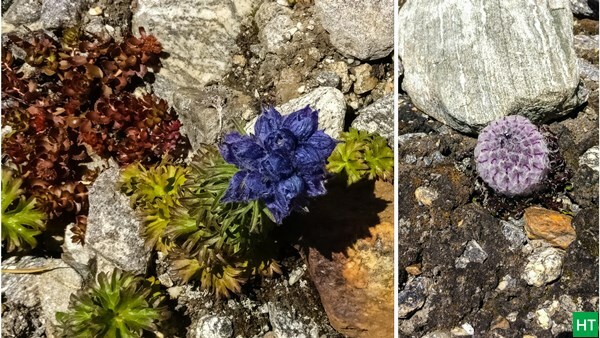 The next few days of our life were like an absolute dream intertwined with scare, which I attempt to chronicle in this blog along with some tips, and tricks that may help the reader be better prepared for this marvellous expedition. 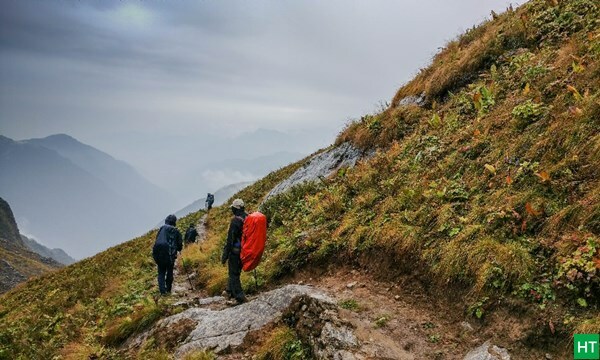 We attempted this expedition post monsoon and learnt from the locals that this is the best time to experience the serene mountains in solitude. 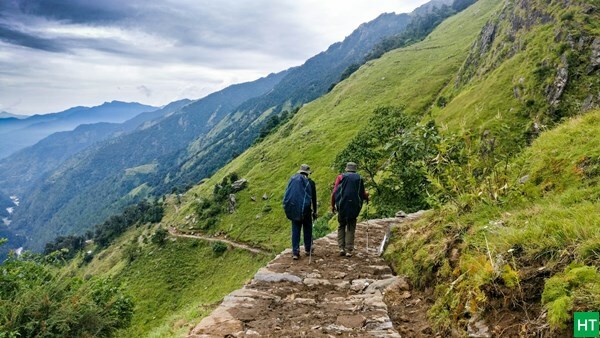 The trek may get easier and little comfortable in summer. However irrespective of summer or monsoon it is indeed a difficult and treacherous trek to attempt. Heavy snowfall may happen anytime and that has resulted in human casualties in the past. 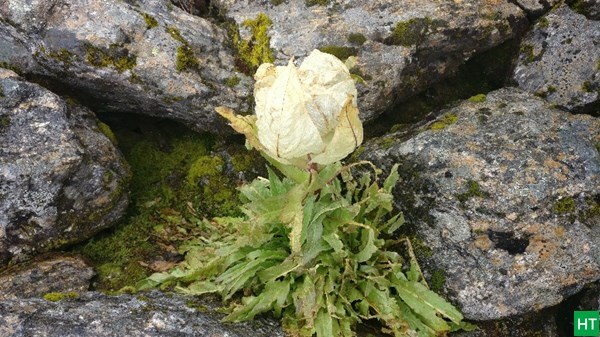 At the time of writing this blog, I received some grave news about the team that started couple of weeks after us, were trapped under heavy snowfall. This resulted in a causality of one of the team member whose body was discovered days later. Extra ration for additional days is must. So even if we are stuck, we aren’t empty stomach. We carried trekking gears like couple of ice-axes, spikes for everyone, 100 meters rope , 5 kilogram filled oxygen cylinder. 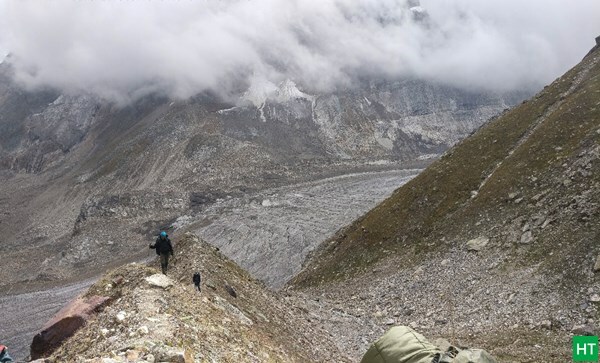 Generally, a porter in High Altitude will carry 20 kg and we took help of seven person apart from Cook and Guide. 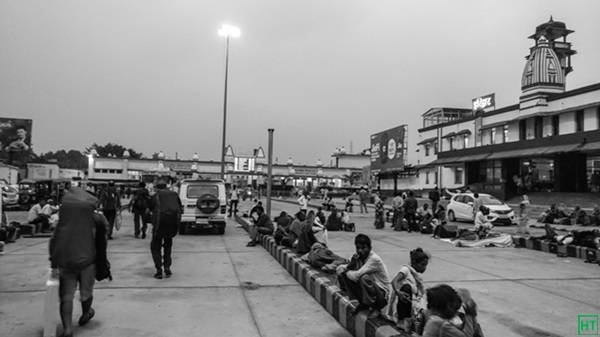 Reached Haridwar early morning at around 6 AM, thankfully the train was late by only one hour. 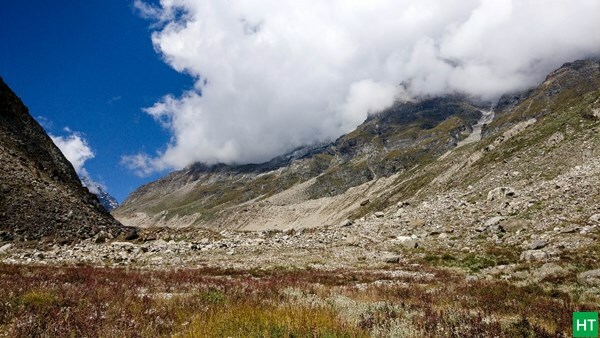 Our first destination from here was Josimath which is one of the famous hill station in Uttarakhand,India. 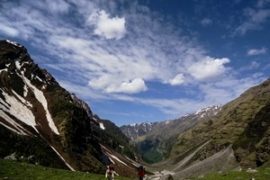 The distance between Haridwar and Joshimath is aroun 280 km which takes almost 12 hours (including breaks like breakfast, lunch etc ) . We had a pre booked car, which costs around five thousands rupees for us. 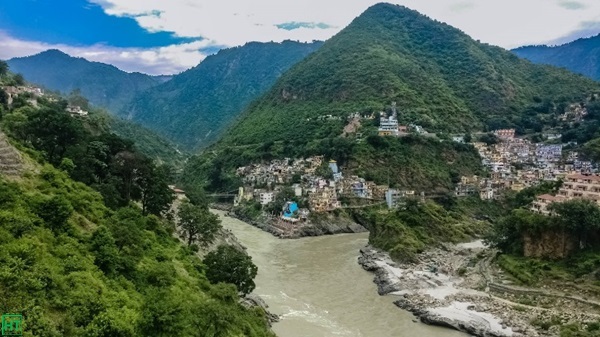 Enroute We stopped at Devprayag which is one of the Panch(five) Prayag of Alaknanda River where Alaknanda and Bhagirathi rivers meet and take the name Ganga or Ganges River. 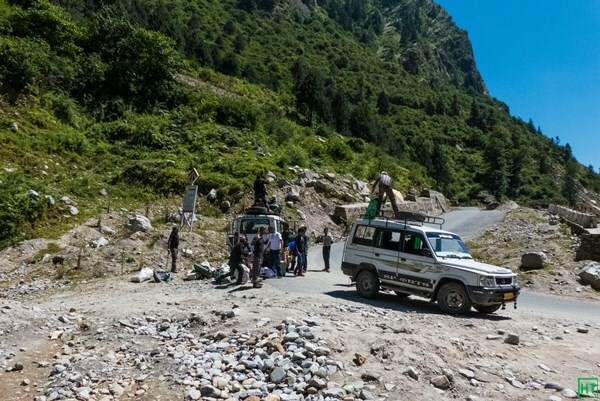 Rishikesh to Josimath is very picturesque road overlooking the Alaknanda River on the sides and the great Himalayas on the horizon. We took our lunch break at NandaPrayag. People like seafood can enjoy fresh river fish here. Finally reached Joshimath , just before the sun wished us good night in this beautiful hill station. 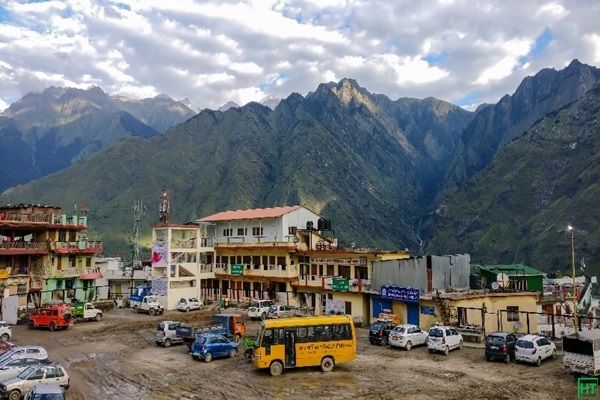 Friends who aren’t interested in strenuous treks should try Joshimath & Auli as their next holiday destination, Its serene surroundings and virgin beauty can put any other hill stations like Manali or Mussoorie to a tough competition.We directly went to Joshimath GMVN hotel and got a budget friendly dormitory for us. It costs us around 1500 rupees per night for 5 of us. 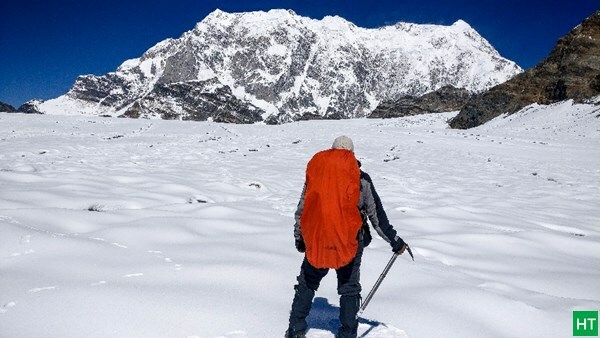 Irrespective of you being an experienced trekker or not, thumb rule of any high altitude expedition is proper acclimatisation. 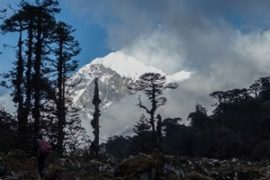 We choose this day for a gentle hike from Joshimath to Auli followed by our rationing and logistic preparation in the evening. 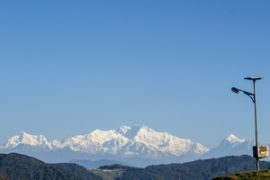 Auli , is a place that I would like to revisit again and again . Picture won’t do justice to the spectacular view of mountain ranges stacked one after other that you find here. The evening was kept for our rationing at Joshimath. 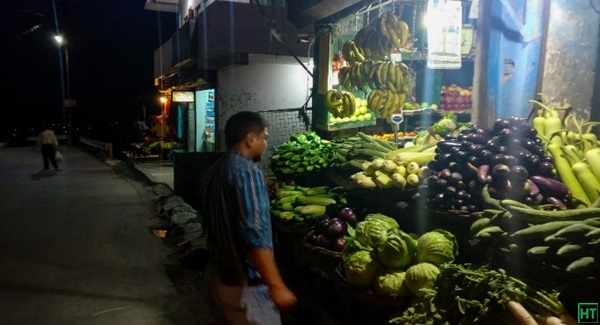 It is quite a big town for you to get all the necessary groceries and vegetables that would last the trip. Now we met our Guide Mr Balwant Singh Panwar, and Assistant Guide Mr Dilip Singh , along with six other support stuff. Mr Pushkar was our designated cook for the trip and we were elated to know that he is equally proficient in churning out vegetarian and non-vegetarian dishes. Good Food assured, Great Team as company and Awesome Mountain ahead, we already had a great start. 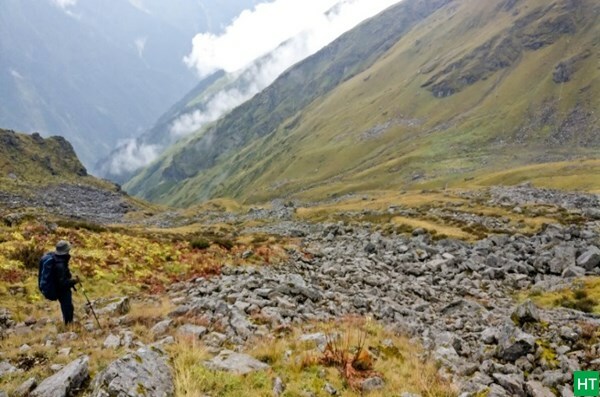 Our first destination would be Belenkuli on the way to Badrinath from Josimath (around 22km from Joshimath). On our way we bid good-bye to the comfort of motor vehicle at Benekuli and from there on rely on the most primitive mode of Human transportation-Legs for the rest of the journey. 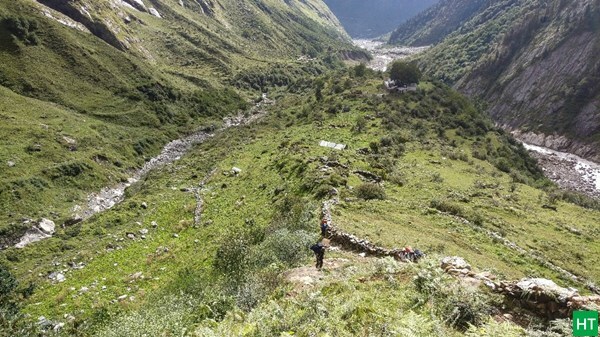 First leg of our journey was to reach Khirao Village, which would also be our first campsite of the trek. 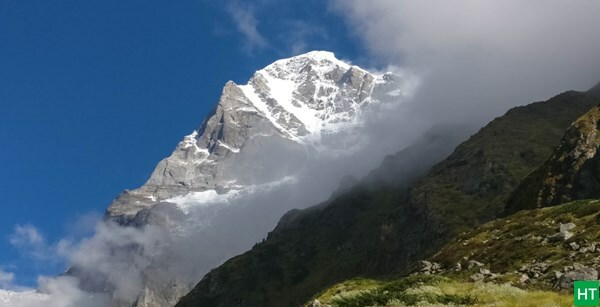 Benkuli is around 2300 mtr and is the starting point of this expedition. 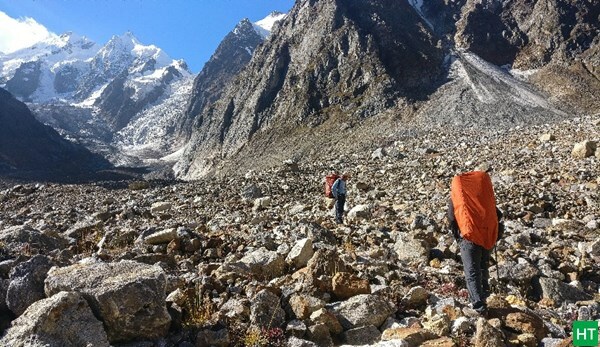 Initially Terrain was rocky with loose boulders scattered everywhere. This was combined with steep ascent that lasted a good 40-45 mins, which elevated our heart rates to the required level. The steep ascent was followed by a quick descent and later one more ascent. As per the prior information, this was supposed to be an easy 2 hours walk but it was certainly not or maybe we are getting a bit old. 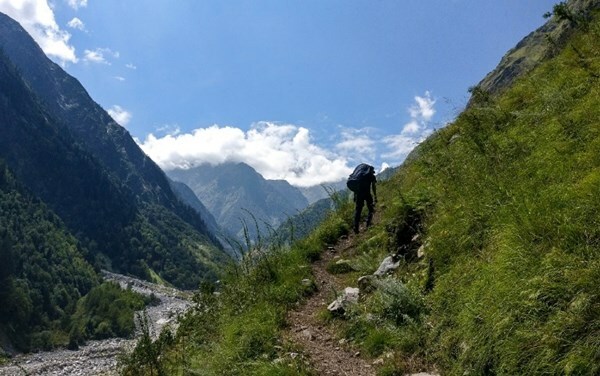 Anyways, a walk however difficult when surrounded by the green meadows and the inviting mountains up front gets so much less tiring as we proceed. 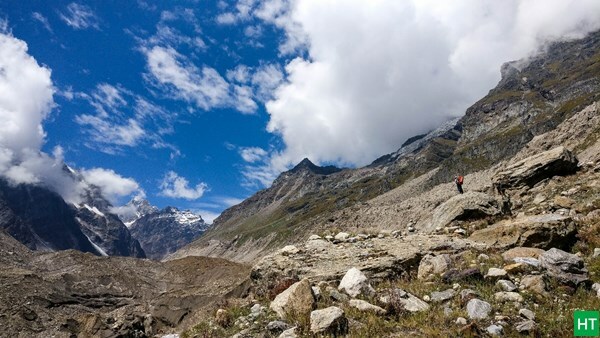 Tiredness replaces an elation a certain high that can be only achieved in the arms of the great Himalayas. Khirao is a very small village with some handful families living in seemingly harsh conditions. It gets its name from the river Khirao-Ganga that’s flowing right beside it. 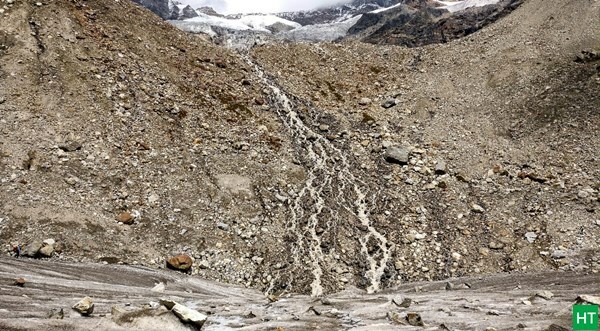 In fact we will trackback this river throughout our journey right up to it’s source glacier in Panpatia. 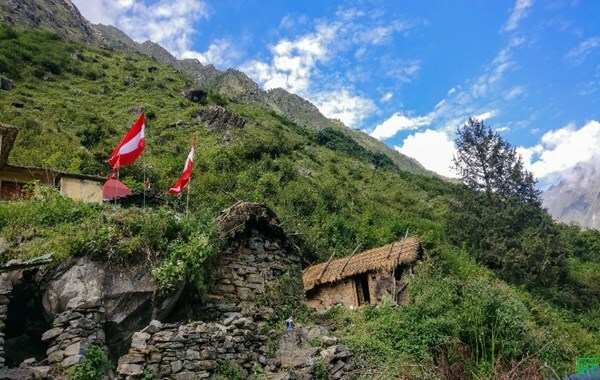 The first day of camp was set up at the upper part of this village, near to Khirao Temple. Campsite at an altitude of approximately 2755mtr. Team took almost 3 hours to reach here. 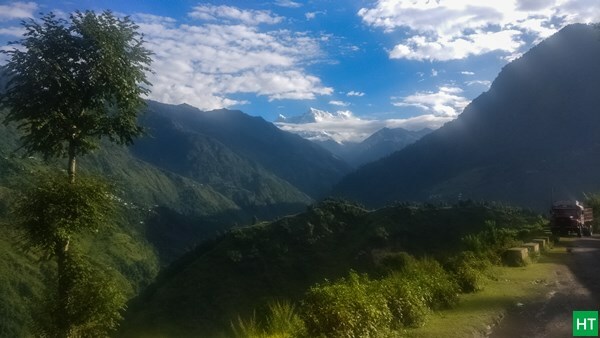 Woke up early to receive the first bad news of the trek – It has been raining from 4 o clock in the morning. With nothing better to do, we continued to enjoy the rain sipping hot tea prepared by Pushkar. Rain started slowing down at around 6:40 AM but this would certainly delay our previous planned start of 7:30 AM. 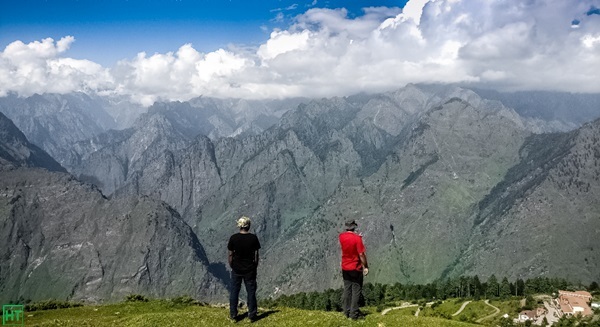 Our next campsite from Khirao is Snout, which is a good 7 to 8 hours of walk. Nobody seemed to be bothered by this delay as Himalayas is the only place where once you are in the zone the time or distance does not matter and you live in the moment while the vastness sinks in. At 8:30 am we started our walk after a sumptuous breakfast with Aloo Parantha. Pushkar started living up to his reputation of being the master chef on the mountains. As lifelong foodie, we highly recommend him for your any trek in this region. Around 2 pm our expedition guide Balwant Ji stopped us at Shepherd Camp as he sensed heavy rains going forward. 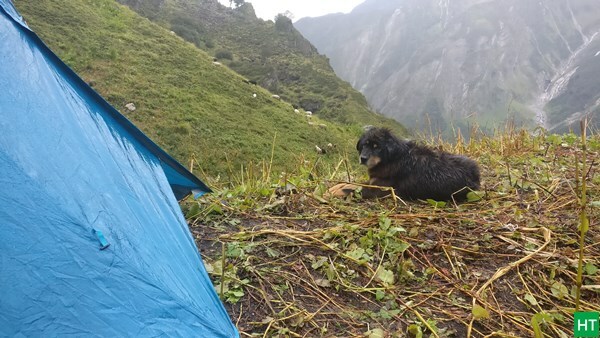 He decided to camp here as It would be risky to drench our groceries and supplied at such early days of the trek. Shepherd camp is at 3400 m approximately. The local name of this place is Gaddi Gadira. 3 pm – Rain started with cold wind around. We came inside tent. Around 4:10 pm – Still inside the tent. Rain has stopped now. 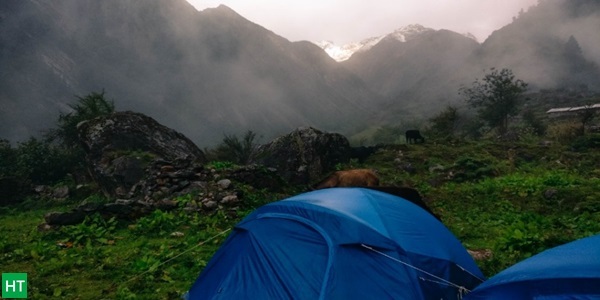 The Tent’s was setup to open to this wide thoroughfare of mountain ranges. The wallpaper of Lush Green Mountains, Cloud cover peaks and one small stream flowing in front is as scenic as it can get. . The team bought almost 12 Kg of lamb meat from local shepherds here and looks like it would be our dinner for the next three nights, at least for the non-vegetarians amongst us. 8 am – Leaving camp late . 8:45 am – It was first time ever I saw the Mystic Mt. Neelkanth . Emotions were expressionless except the jaws felt down !! 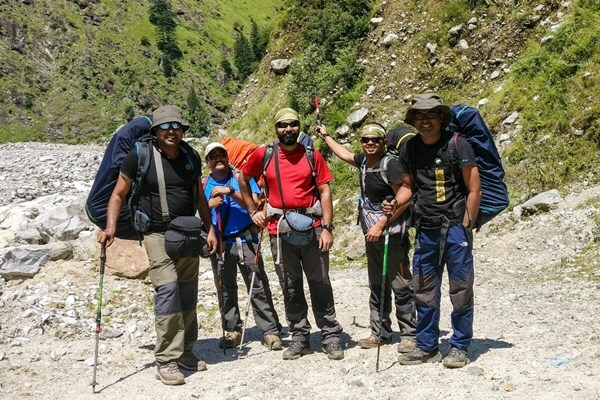 I travelled with the porters for another 30 mins to finally re-unite with the guide and the rest of my team. By now my body was super exhausted and I had almost finished my water as well. Each minute of the next couple of hours walk was punishing that I pushed through with a zombie like stroll. I was totally dehydrated by the time we reached campsite. This route also had very few water sources so my suggestion would be to carry additional water reserves. Had plenty of water mixed with salt and lemon, sat still for almost 30 mins with chocolate in my mouth, puked a few times followed by a bowel movement. 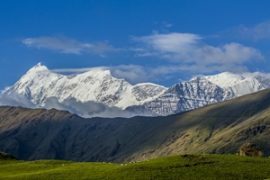 All these aided to a quicker-than-expected recovery, Sapta Da mentioned that running noses are the signs of better acclimatisation at high altitudes and found some solace in his words. 7:30 PM: Finished today’s diner and back inside sleeping bag. Very cold outside, shivering a lot inside the tent too. Around 8 pm I crashed for a well-deserved sleep. 6:10 pm – “Point of No Return” from here. Another day traversing through the boulders. we were discussing amongst us that it may have been easier before monsoons as walking on ice is much easier than these loose rocks. Of course that would mean we had to setup our camps on snow and icy ground, which may not be a good thing for these many days. The day started with walking on moraine, followed by crossing a glacier and a prompt steep ascent. We reached the campsite at around 2:45 pm and were greeted by steady snowfall. We camped at an altitude of approx 4510 m.
Finally on the ridge, a relief! 8:30 pm – Its getting colder, all five us were sitting in a single tent. Outside of tent looks like a white screen with almost zero visibility. Every day the weather goes bad after 12 noon or so . We were contemplating to have an early start from now on. If we start the day earlier, we may be able to avoid such spurts of bad weather enroute to our campsites. 8:45 pm – It was more or less a rest day for us. 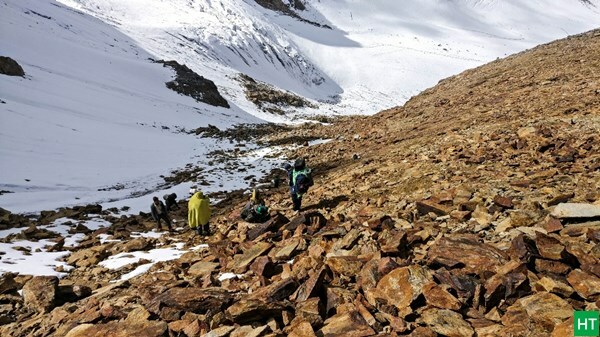 We just walked for 3 hours to reach to the base of Panpatia glacier and ice field. 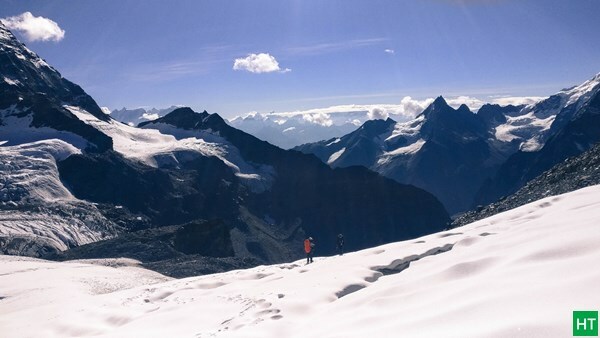 This place is just below our final ascent to reach the Panpatia Ice Field. We reached the campsite by 11:30 am. 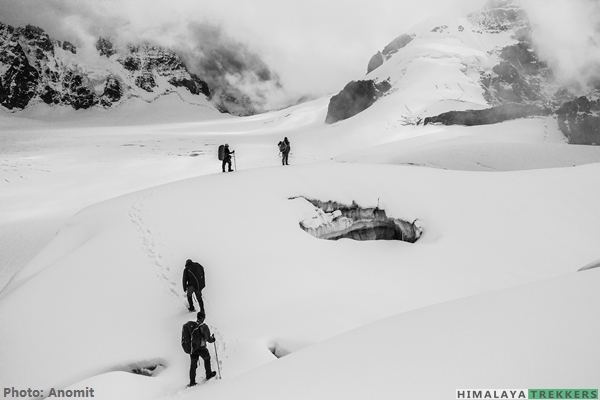 This was a tricky and risky terrain while crossing the rocky Parvati gully. Several times our guide helped us to cross possible traps we were unaware of. Altitude now is approximately 4800 m with the atmospheric oxygen dropping to around 57% that of sea level. Climbing 300 m took us three hours and I advice every caution while crossing this treacherous terrain. I may not be the most eloquent while describing the beauty of Himalayas hence I leave you with this picture worth of thousand words and hope it does some justice to its unspeakable beauty. 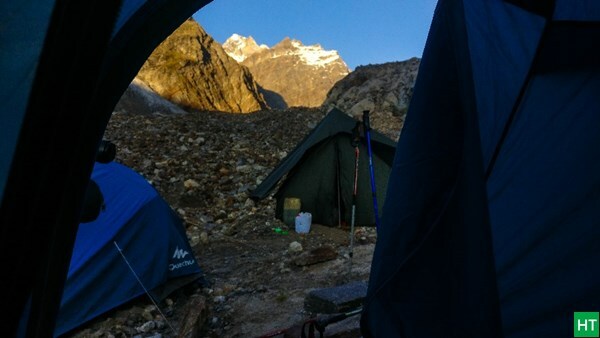 Tomorrow is the day , we all eagerly waiting for …… The camp on upper Panpatia ice field. 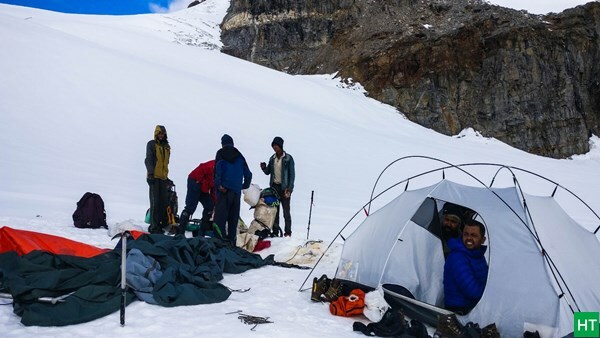 5:30 pm – We are sitting inside tent on the snowfield. Only two tents today. We five will sleep in a single tent and Kitchen tent will be for rest of the support team. A mixed day . We reached middle of the Panpatia ice filed by morning 9 am. Weather gods had smiled on us with a pleasant sunny day. We spent almost an hour or more on photo sessions in the great Himalayan studio. Around 10:30 am we started towards Panpatia Col. 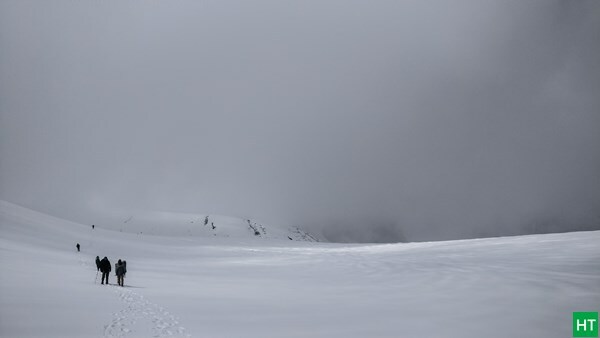 Initially we had the plan to cross the Col on the same day but the mystery land had something else for us !! The route was surrounded by deep crevasses, we had to use rope to cross one of the crevasse. By 12:30pm weather changed all of a sudden and we were engulfed within clouds with reduced visibility. 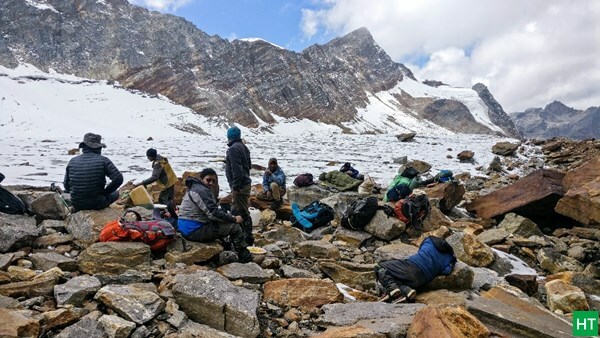 Team moved forward slowly decided to set campsite around very near to Panpatia Col at around 2:30 PM. Guide did not advise us to move forward. 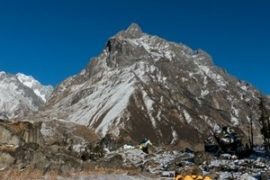 This deviated us from our earlier plan to cross the Col by today and now had to settle down here, 300/400 mtrs away from Col. Pushkar hit his peak form and, we received hot tea , popcorn , hot soup , hot Bournvita energy drinks all in quick succession. The day was eventful we had one of the porters down with AMS (acute mountain sickness) attack around afternoon. We were equipped for such events and team made good use of the oxygen cylinder and feet massage to keep him oxygenated and warm. Another porter had not used any sunglasses throughout the day and got severe eyes pain due to the reflected sunlight. (A note to future climbers to double check that the porters that travel with you are equipped with such bare essentials for such treks.) On top of all this our guide Balwant himself was not doing great and had vomited multiple times on the way up here. 7:15 pm – Have to be active, it is freezing even inside the sleeping bag. Did not dare to go out of the tent, so thought of scribbling a few lines while am awake. 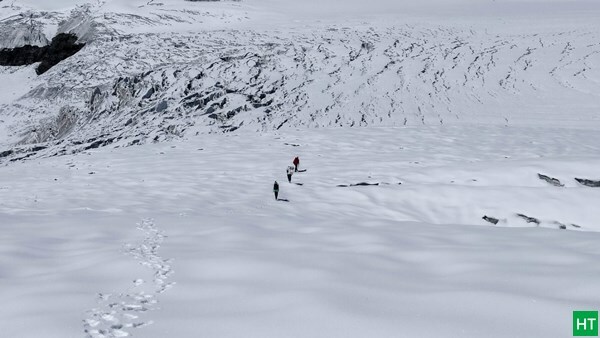 Today morning while walking on the ice field, Guide had shown us snow leopard’s tracks on the ice. It was quite fresh and as per him the elusive animal had crossed, the field today early morning (may be 4/5 hours before we reached there). We were discussing that at this point we won’t mind inviting leopard inside the tent to get some warmth out of it’s cosy fur. We hoped it has finished its diner, so it should not mind the warm shelter aided with the cumulative fat of five of us. I always prefer company of people who crack jokes and laugh aloud. You would be surprised how quickly a good laugh can warm your body. Sapta Da asked other porters (who are in the kitchen tent), not to let the AMS sick person completely sleep but to check regularly how he is doing. We were going to live every moment of this night … long night! Good Night. 11 pm – The Magic Day!! Morning 8:30 am we moved forward. Then comes the famous descent from the Col. We walked almost 20 mins on the snow and then suddenly saw the steep descending path that awaits us. For a while I was taken aback and thought I might not be able to make it. Took a little pause summoned up courage and started my struggle. It took us almost three hours to reach Suja Sarovar from the place where we had lunch. 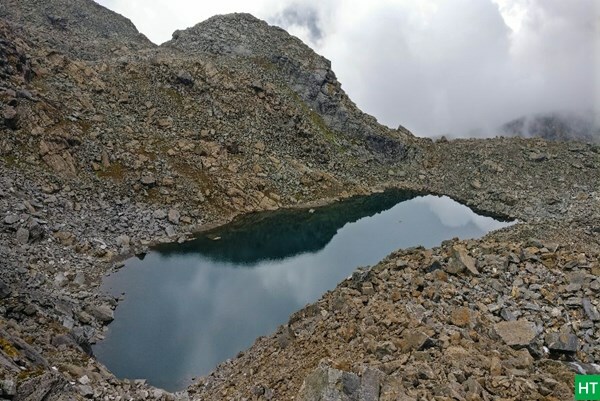 Sujal Sarovar had a supreme view , with Mount Chaukhamba’s reflection falling right on the lake. Unfortunately we weren’t able to setup camp here on boulders. May be during pre-monsoon this place remains covered with snow making it possible to camp. We continued to move and had to walk another 3 hours to reach campsite that didn’t really have any names. Camp is approximately at 3900 m. We came down a lot in 9/10 hours of walk today. Just like life going down is always faster than climbing up. We let our muscles relax a bit and had a late start at around 11 am. Reached Kachni Khal around 2 pm . 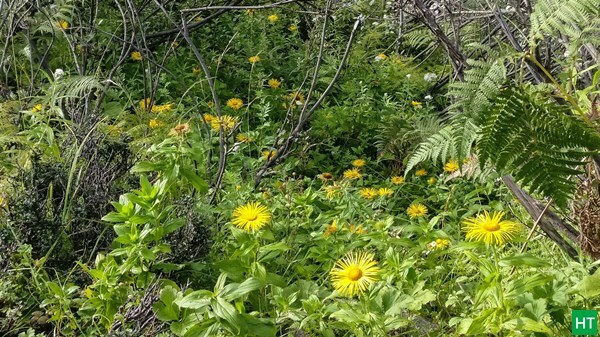 Nice Bugyal views with Bramha Kamal bloom all around. From Kachni Khal we are supposed to reach Madhyamaheshwar today. We were already late for our destination. This was a proper wide trail except a very few places that still had some of the dreaded boulders. 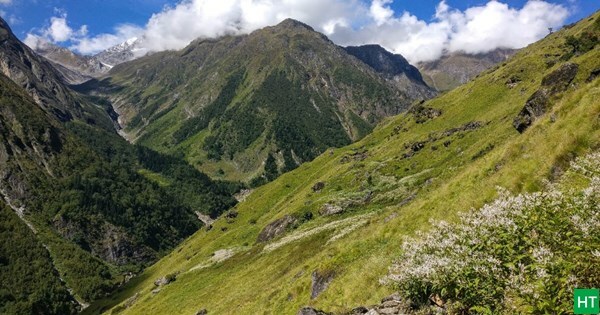 This is very beautiful trail and the icy taverns of past few days being replaced with the dense green vegetation is always a heavenly feeling. We had grossly underestimated the distance and reached Madmaheshwar only by around 8 pm in the evening. It would be at least 8 to 9 Km away from Kachni Khal as opposed to 5 Km marked on stones. Last Day of our trek. Madhyamaheshwar to Ransi is almost 20 to 22 Km distance though we were in no mood to start early . Last night we reached here by 8 pm and got a room with cosy beds and blankets beside the temple! Guide was busy pushing us with continuous “Chalo bhai , chalo chalo” (lets go brother). Ransi to Madhyamaheswar is a beautiful trek too. We reached Ransi just before sunset. Today we drive back to Haridwar via Ukhimath and Rudraprayag. All well that ends well! P.S. 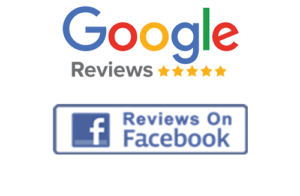 All photos are shared by Author. 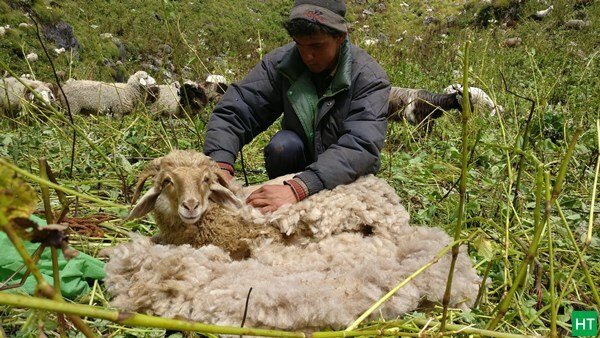 Anomit is wandering on Himalayas for a decade now. He has special affection and love for Garhwal Himalayas. 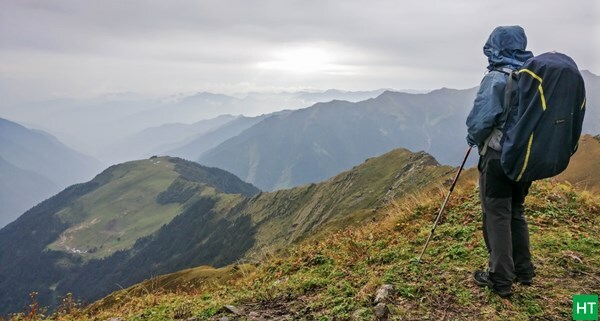 After completing common treks in early years, he is now more focused on offbeat and challenging trails.